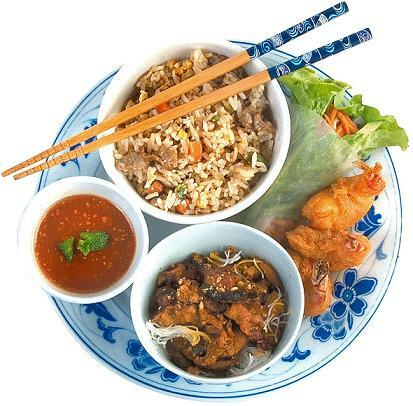 Chinese meals are generally based around two main elements: firstly, a starchy "main food" (Mandarin Chinese: Zhushi) dish such as noodles, rice or steamed buns ("mantou"), and secondly, accompanying meat, seafood or vegetables (Mandarin Chinese: Cài). It would wrong however to think of China as simply being home to a single cuisine. Each region of the country has developed its uniquely culinary style, and additionally overseas Chinese communities around the world have both adapted traditional Chinese dishes, and developed entirely new dishes. 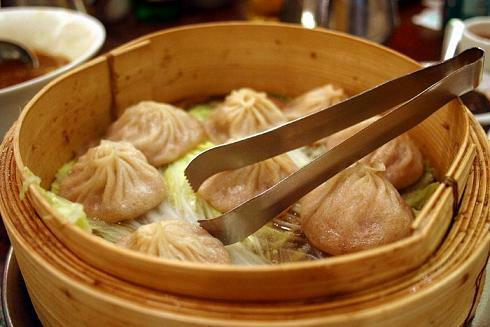 Baozi (xiaolongbao) - Steamed buns usually containing meat soup (sometimes seafood or vegetables may be used instead). The buns are initially prepared using a meat gelatin filling, but when the bun is steamed, this melts and becomes soup. Congee - A porridge, usually made from rice, although sometimes barley, cornmeal, millet or sorghum may be used instead. Guotie - Fried dumplings containing ground (minced) meat and/or vegetables. Jiaozi - Steamed dumplings containing ground (minced) meat and/or vegetables. Shuijiao - Boiled dumplings containing ground (minced) meat and/or vegetables. General Tso's chicken - Deep-fried chicken in a sweet-spicy sauce. This dish is very popular in Canada and the US, but is virtually unknown in China. 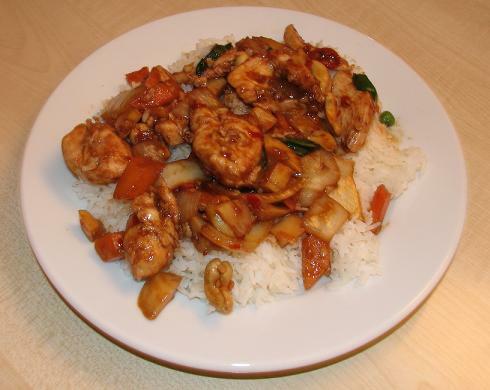 Kung Po chicken - Chicken cooked with Sichuan peppercorns, Shaoxing wine, and nuts (peanuts or cashew nuts). In Western countries, the dish has been adapted to local tastes and ingredients (for example, by using bell peppers), and additionally other meats, or seafood, may be used instead of chicken. Mantou - A steamed bun. One of the staple dishes of North China. Peking duck - Originally from Beijing (which used to be known as "Peking"), Peking duck is one of the most famous Chinese dishes. A duck is glazed with a syrup and roasted, it is then carved in front of diners, and eaten by wrapping the duck meat, with scallions or cucumber, and plum sauce, into small steamed pancakes (Mandarin Chinese: pinyin). In the UK, the duck is generally prepared using more spices, fried instead of roasted, and known as "cripsy aromatic duck". Soy egg - A hard-boiled egg in soy sauce, sugar and water, flavored with herbs and spices. Tea egg - A hard-boiled egg, soaked or stewed in tea. 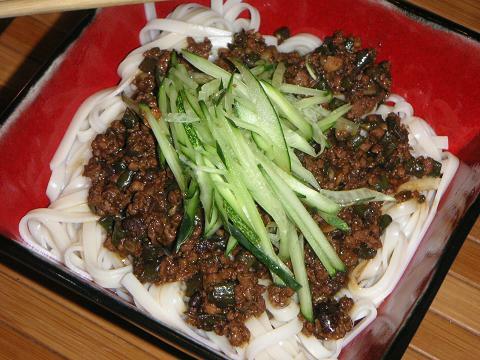 Zhajiang mian - Thick wehat noodles with ground pork, stired-fried with fermented soybean paste. Zongzi - Bamboo leaves filled with glutinous rice and other fillings. Zongzi are boiled or steam before eating.